Office suites are being snapped up at MAB’s latest commercial development, CubeOne, with local business owners jumping at the chance to own their own premises. With construction complete, local businesses are moving into CubeOne taking full advantage of the central location, excellent transport links and thriving commercial precinct. Danny Lavigne, Managing Director of Blynx Insurance Services, and Berwick resident, is one of the first businesses to move into CubeOne. Mr. Lavigne’s company services many of those who live in the local area, benefitting from proximity to Fountain Gate Shopping Centre, the City of Casey Municipal Offices and nearby walking trails and cycle tracks. “Business is booming in the South East and there’s not many office spaces that provide a high-quality and affordable offering”, Lavigne said. “The office space is not only a great environment for employees and clients, but I have confidence there’s a huge business opportunity in the area, which is why I chose to invest, rather than lease”. The Narre Warren business precinct is within Australia’s 12th fastest growing city, with a projected population increase of almost 200,000 by 2041. CubeOne is surrounded by broad open space and access to key transport links, promoting walkability and community. 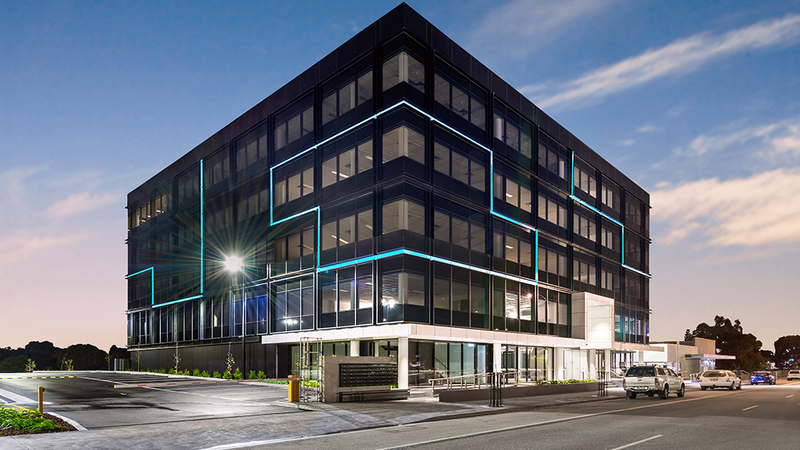 The development features 40 strata office suites from 45m2 including a prominent retail frontage and illuminated external façade, providing businesses with a high visual presence. Michael Martin, Director Business Parks at MAB, said “CubeOne follows a trend in commercial property developments decentralising Melbourne and providing businesses with affordable commercial offerings, reduced travel time and greater work/life balance. “We’re seeing record sales at CubeOne because of a growing need for spaces outside the central city where small business owners can invest in their own premises in an environment that is conducive to a modern, mobile and integrated lifestyle”. Ashwin Pandit, owner of Mocha Mojo Café & Lounge in Berwick, is another local business owner who made the decision to own their own business. Mr Pandit purchased at CubeOne and includes an outdoor seating area, capable of hosting up to 100 patrons. He was looking to expand his business, opening a new site close to his existing cafe to minimise commuting hours and mobilise existing staff. His new café, Butlers Kitchen at CubeOne, will open early 2019. “With the local economy growing and not many business park cafes catering to the growing number of local office workers, I jumped at the chance to invest,” said Mr. Pandit. Limited opportunities remain to secure a rare chance to own your own office suite. To enquire about CubeOne visit cubeone.com.au.